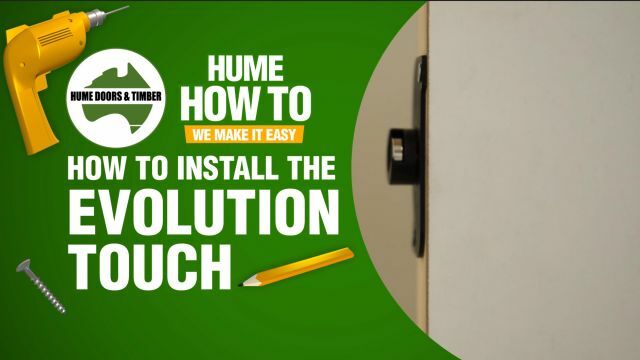 The correct way to install a Hume Doors & Timber cavity unit door that slides away into a concealed recess. Unit size is tight, please allow extra for packing when preparing the opening. 1.1 Fit and screw steel head/track to top of cavity unit (after removing temporary spacer block at top). 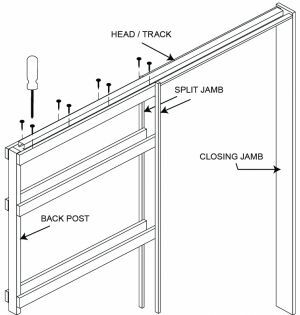 1.2 Fix closing jamb to head/track (closing jamb is not supplied QLD. NSW. ACT). 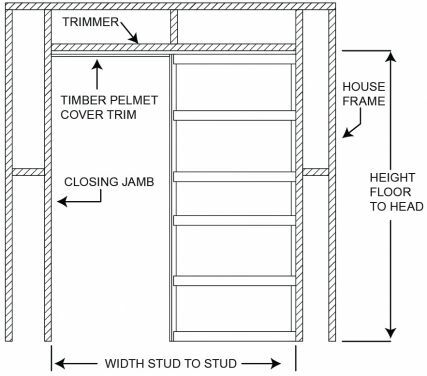 (pack under cavity unit if required for additional clearance under door) then fix through back post of cavity unit into house frame. 1.4 Level the head/track and fix through into house frame. 1.5 Plumb closing jamb, pack and fix through to house frame. 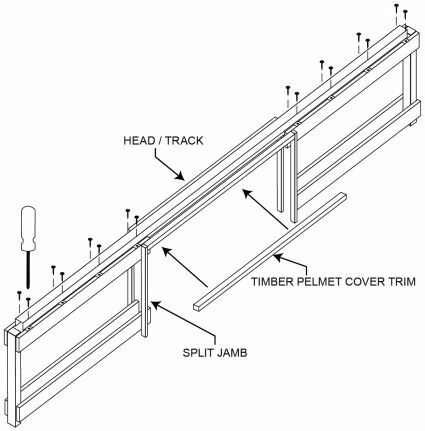 remains in place during cladding and tiling to prevent distortion of split jambs. This block should only be removed when installing the door. 2.1 Check the door is straight and free of any imperfections. 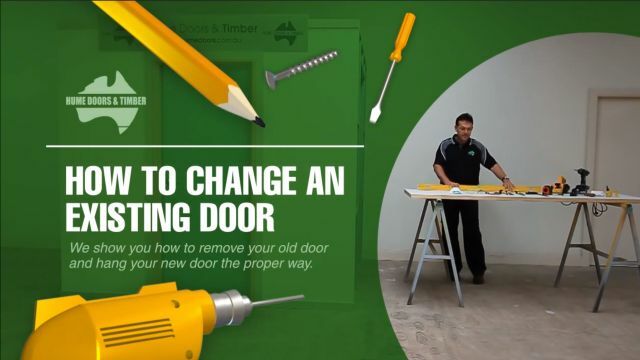 Door must be fully sealed according to Hume Doors & Timber guarantee. NOTE: Now would be a good time to fit any door furniture. 2.2 Attach base plates to top edge of door 80mm from each end with nylon lock tabs both on the same side of door. 3.1 Check that no fixings or other obstructions are protruding into the cavity that may damage the door. 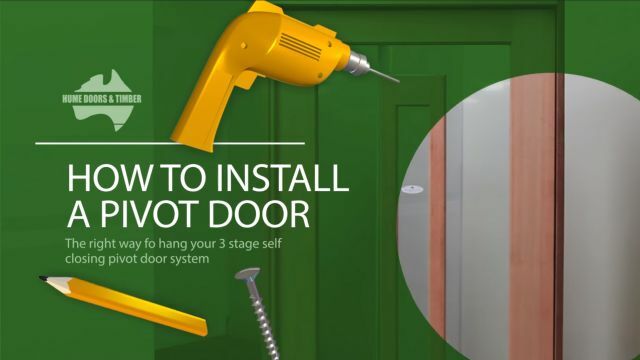 3.3 Slide the door into cavity, lift door and slide carriage pins into carriage base plate, then lock in with lock tab. Repeat this process for second carriage. 3.4 Using spanner supplied, adjust height and plumb against closing jamb. 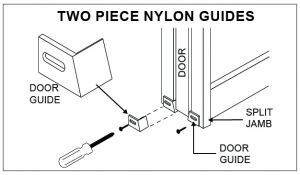 3.5 Fasten door guides at the bottom of split jambs as shown and adjust until the door slides evenly and smoothly into the cavity unit. 3.6 Cut timber pelmet cover, trim to desired length, fix with screws provided. 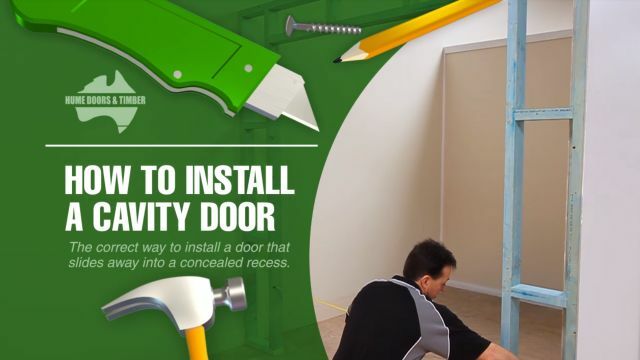 (To remove door unscrew removable pelmet, remove door guides and unlock nylon lock tabs. Door will unclick from base plate/s). (double door stop supplied separately) Unit size is tight, please allow extra for packing when preparing the opening. Height is the same as single opening. ensuring the 2 head/tracks are cut to correct length and butted together as shown. 4.3 Install double stops into the track as shown, making sure the doors close to the centre. 4.4 Using the timber pelmet cover trims (1pc comes uncut with each single cavity) cut to span the double opening as shown, fix with screws provided.